D.W. Buffa – Best-Selling Author of "The Defense"
Welcome to the official website of the best-selling author D. W. Buffa, acclaimed writer of some of the best contemporary crime fiction books and the creator of the Joseph Antonelli novel series. 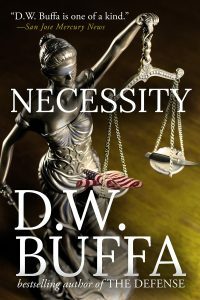 D.W. Buffa has written seven legal thrillers featuring Superstar Defense Attorney Joseph Antonelli, a character whose thoughts and actions reflect the sometimes harrowing reality of the legal system and how it can be easily manipulated by talented lawyers. As a top crime fiction author in the U.S., his stories are ripe with suspense and have earned rave reviews over the past decade from the New York Times, Publishers Weekly and other authoritative editorial institutions. The third book in his series, The Judgment, was nominated for the Edgar Award for Best Novel of the Year. His best-selling novel, The Defense, earned him a steady following in the world of Crime Fiction and Legal Thriller novels alongside John Grisham, Tom Clancy and Scott Turow. D.W. Buffa is now on Kindle! Polis Books and Blue Zephyr Publishing are D. W. Buffa’s current publishers. Several courtroom thrillers and contemporary works of crime fiction are now available as e-books for the Amazon Kindle and other e-book readers. You can also read reviews and order books online through www.amazon.com and www.bookreporter.com. Certain out-of-print books, as well as books that were never released in the United States such as Blue Rose and Evangeline (printed version), can be purchased through second-hand merchants like www.dealoz.com and the Amazon Marketplace.